Maha has signalled her intent to focus on intentionality in her forthcoming OER17 keynote and seems to flag up cliques as having a power dynamic that intentionally denies access. She gives a comparison within VConnecting of the close-knit communities that form on Slack and the public Twitter and Google Hangouts. That caught my attention because I have done a lot of wondering about the relationships between behind the scenes and public interactions in general, and specifically relating to some current work on network-building. I think that a qualitative study from in-community and ex-community perspectives of this would be interesting and could contribute to critical perspectives on openness. All of this made me think about some research that Jenny Mackness, Mariana Funes and I did that looked at qualitative contributions/survey data and quantitative activity data across different tech platforms on one MOOC. We found that community could be a confusing idea for participants who espoused heterogeneity and that platform design could also have an impact. We can think of intentionality as relating to the agency of individuals or as an emergent property of groups but if we take a post-human perspective on intentionality then intentionality and agency can be shared between humans and non-humans such as the platforms. I think this view could be helpful. I am not really sure that participants who felt excluded by the lash up of individuals, groups and tech would feel reassured that this did not meet a particular definition of a clique. Like community, clique is a term that I use fairly sparingly now after some mixed experiences. Both terms seem to me to provoke strong emotions, and can get in the way of sustaining difference without exclusion. It would be good to look at cliques as something that we can all contribute to despite our best intentions and working on understanding what’s going on is a worthwhile enterprise. My very lovely slice of the Interwebz has thrown up lots of interesting ideas about how all of us can (and can’t) take care of ourselves and each other, and how institutions respond to the idea that there might be a problem in caring for ourselves. My ideas are all over the place (not least because I am just coming out of the common cold from hell) but I thought that I would set them down in their current state of flux and see where they take me. Positioning wellbeing and self-care at the heart of institutional initiatives to build digital capability is both radical and vitally important. Acquiring digital literacies and building identity in digital networks has to be a good thing but the institution is a context as well as an agent. In this recent article, Helen Lees contrasts the two academic lives she has led, first on a fixed term research contract, and now in a permanent position. She acknowledges that she became more resilient over time but crucially identifes the role of context in this. Precarious employment is not a good environment for learning resilience. Kate Bowles isn’t sure that HE can be reformed but instead celebrates the kindness that we can show to each other as “we are all here now”. That seems more attractive than sitting in a room learning how to be less of a problem. Forms of flexibility are leading to an enhancement in students’ experience of higher education and to an impoverishment in that experience; and it is by no means clear as to how, in general, matters might proceed from here. conduct a self-scrutiny of the extent to which an institution is responsive to its environment. I retired from UK Higher Education 3 years ago, and have had plenty of time to reflect on the recent turbulent environment of HE. For me, what Viv describes is a bit of a knee-jerk response from management to a problem that relates more to internal and external environments rather than any inherent deficits in staff or their attitudes. In my employment, I experienced several occasions where a problem that was experienced in the classroom was not explored systemically to find out the roots and possible responses. Centralisation of processes eg admissions can not only cause some problems but simultaneously separates the process and those who mandated its centralisation from its outcomes. Communication needs to travel up and down hierarchies and feedback upwards on problems can be seen as off-message to preferred institutional narrative, pushing responsibility and blame back down the hierarchy. This is consistent with the worst sort of resilience training. Staff welfare cannot be looked at in isolation from the contexts in which they work. Actively confronting challenges, escaping emotions so you can behave in a problem-focused way sounds like a great idea but what happens to staff who try to solve problems within their organisation but are blocked because the solution would involve change of policy within the institution? What do staff perceive resilience to really mean? Are staff also being encouraged to speak out and are they listened to in their organisations? What if staff perceive resilience to mean not speaking out and to generally shut up? Viv shared compelling evidence that stress is endemic in HE workplaces. As the labour workforce changes, with fewer permanent contracts, more short-term and part-time contracts, more redundancies and retirements, the needs of staff are placed in tension. I have to say that the staff who are placed in the most untenable situations are those on fixed and very short-term contracts doing jobs that would previously been have done by permanent staff. They can be paid, usually poorly, for “teaching” with sundry administrative tasks associated with assessment and student support falling between the cracks. Full-time staff, like module and programme leaders already themselves experiencing stress from increased workloads, can then be put in the invidous position of asking colleagues on part-time contracts to increase their work (for example to attend examination boards) for no additional pay or taking on this additional work themselves. This pits staff members against each other without looking to the broader causes. Specialist: Lead marketing teams with an awareness of the role digital technology plays in organisational branding. How does organisational branding sit with the need for institutional self-scrutiny that Ron Barnett recommends and a culture for not speaking out that Viv Rolfe hints at? I don’t think that individuals, networks and institutions need be an impossible triangle of resilience but if silencing as a covert form of power exists in an organisation, the triangle can become a neat way of shifting responsibility away from the institution to the individual, thereby increasing the individual’s stress and decreasing their ‘resilience’. Resilience is a shared responsibility but one that exists in unequal power relations. I have read a lot about fragility in the past couple of years observing and sometimes experiencing examples of male fragility and questioning my own white fragility. I wonder if there is also some institutional fragility going on in institutions that instigate training for resilience in the absence of self-scrutiny. Is this an example of presence or absence of institutional resilience? Author francesbellPosted on April 2, 2016 April 26, 2016 Categories bellblog, learning and education, research and scholarshipTags communication, digital wellbeing, fragility, institution, resilience, responsibility3 Comments on Institutional fragility and resilience? I saw this cartoon again a week ago and it reminded me of my first reaction to it so I went off to see what some others thought. 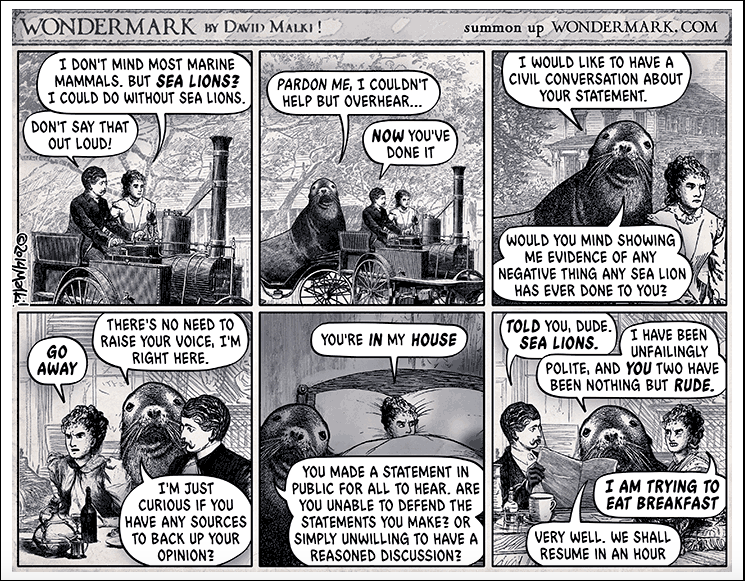 “I don’t tweet, but I’ve found the Sea Lion strip quite thought-provoking. The most interesting thing about it to me is that it’s quite ambiguous to me which of the parties is supposed to be “in the wrong”. The general reception of the strip seems to be “oh yes, I recognise that archetype, sea-lioning is an obviously terrible thing to do”. But that’s not at all how I read it originally. If the person in the car was saying “I don’t mind most queer people, but transgenders? I could do without transgenders”, the sea-lion character would be a heroic person standing up against off-hand degrading comments of a bigot. The sea-lion character is, in fact, unfailingly civil, just as they claim. There are no ad-hominems, no doxxing, no abuse or threats. The woman never justifies her initial comment, or apologises for it either. The sea-lion’s following around of the people and invasion of their private space isn’t really a great metaphor for Twitter or Facebook, considering that those are explicitly public spaces where users can disengage freely at any time (and/or switch to a more private mode of communication). If tweets or status comments are bothering you at breakfast or in bed… maybe just put your dang phone away? When I first saw the cartoon, I found it to be ambiguous too and perhaps that’s its value. Apparently, sea-lioning has been adopted as a verb making it more negative but just as ambiguous. So I can imagine that some would want to argue the toss about the ‘real meaning’ of the Terrible Sea lion but claiming of terms is an unedifying but common practice on the social web as far as I can tell. I would want nothing to do with that. increased tolerance – if someone questions us, why not assume good faith (to start with at least) and just answer them politely? If you were referring to them inappropriately, why not apologise and take it from there? A bob of sea lions, A colony of sea lions, A crash of sea lions, A flock of sea lions, A harem of sea lions ………….. a group of females, A herd of sea lions, A hurdle of sea lions, A pod of sea lions, A raft of sea lions, A rookery of sea lions, A team of sea lions. One last thing – if you are going to be a sea lion in the positive or negative sense, it’s probably a good idea to fly solo where possible – noone wants a crash of sealions.